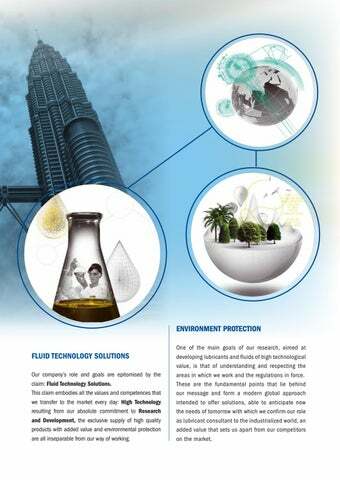 ENVIRONMENT PROTECTION FLUID TECHNOLOGY SOLUTIONS Our companyâ&#x20AC;&#x2122;s role and goals are epitomised by the claim: Fluid Technology Solutions. 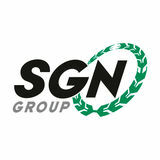 This claim embodies all the values and competences that we transfer to the market every day: High Technology resulting from our absolute commitment to Research and Development, the exclusive supply of high quality products with added value and environmental protection are all inseparable from our way of working. One of the main goals of our research, aimed at developing lubricants and fluids of high technological value, is that of understanding and respecting the areas in which we work and the regulations in force. These are the fundamental points that lie behind our message and form a modern global approach intended to offer solutions, able to anticipate now the needs of tomorrow with which we confirm our role as lubricant consultant to the industrialized world, an added value that sets us apart from our competitors on the market. Copyright Communication & Design PETRONAS LUBRICANTS - 10/2014 - E.D. Petronas Lubricants International, lubricants division of the Malaysian international energy and petrochemical company PETRONAS, is active worldwide in the development, production, sale and distribution of lubricants and functional fluids for the automotive market. equipment, with over ninety years of experience in the automotive and lubrication industry. PETRONAS Lubricant’s response to the search for lubricants for farm machinery and construction equipment is the Arbor range , comprising: engine oils, transmission oils, hydraulic oils, brake fluids, greases and coolants. In addition to these products the Arbor range also includes lubricants for gardening and groundcare machinery.